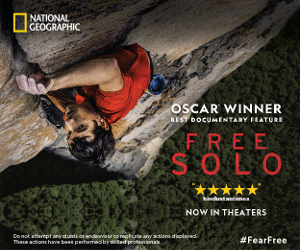 FREE SOLO, National Geographic’s Oscar-winning documentary is set for a theatrical release on April 12, 2019 in India, as announced by the brand today. Indian audiences have been eagerly awaiting the documentary after it was praised by most major international movie critics, like The New York Times which acclaimed the film as “an extraordinary gift to everyone who believes that the limit of human achievement is far from being reached”. FREE SOLO, which won the Best Documentary at both the Oscars & the BAFTAs, will release across theatres on Friday across key metros such as New Delhi, Mumbai, Bangalore, Chennai, Ahmedabad and cities like Chandigarh. From award-winning filmmaker Elizabeth Chai Vasarhelyi and world-renowned photographer and mountaineer Jimmy Chin, the directors of the Oscar-shortlisted film “Meru,” FREE SOLO, a stunning, intimate and unflinching portrait of the free soloist climber Alex Honnold, as he prepares to achieve his lifelong dream: climbing the face of the world’s most famous rock – the 3,200-foot El Capitan in Yosemite National Park without a rope. The film is an edge-of-your-seat thriller and an inspiring story of an athlete who challenges both his body and his beliefs on a quest to triumph over the impossible, revealing the personal toll of excellence. As the climber begins his training, the armour of invincibility he has built up over decades unexpectedly breaks apart when Honnold begins to fall in love, threatening his focus and giving way to injury and setbacks. Elizabeth Chai Vasarhelyi and Jimmy Chin have beautifully captured deeply human moments with Honnold as well as the death-defying climb with exquisite artistry and masterful, vertigo-inducing camerawork. The result is a triumph of the human spirit. People in India are twice as likely to exercise than diet in order to stay healthy, YouGov’s new research reveals. On the occasion of World Health Day, we questioned people about what steps do they take to be in good shape. The study shows that at present, more than 1 in 2 people (53%) say they exercise regularly while 1 in 5 (21%) follow a specific diet in order to stay healthy. However, around 1 in 10 (9%) are likely to start exercising while almost half of these (5%) intend to follow a diet in the future to be in good trim. Of those who currently exercise, more than half (55%) practice yoga, while under half (45%) run. As compared to males, a higher number of women are currently indulging in Yoga (65% vs 47%) and Zumba (21% vs 5%). 2 in 5 people either workout at the gym (39%) or brisk walk (38%), a fourth (25%) play some kind of sport while a fifth (21%) swim in order to stay healthy. On the other hand, from those who said they follow a diet in order to stay fit, low-carb diets seem to be the most popular. 1 in 3 (31%) have tried a low-carb diet, 1 in 8 have tried a ketogenic diet (12%) or Atkins diet (11%), and 1 in 25 (4%) have experimented with a Dukan or a Paleo diet. Just under a quarter have tried being vegan (24%) while 1 in 6 have explored intermittent fasting (17%) or an ultra-low-fat diet (16%). Just above a quarter (26%) have never tried following any diet plans. When looking for diet plans, it seems we Indians prefer a more personal approach rather than a professional one. 2 in 5 either look up a diet online or on an app (39%) or take recommendations from others (38%) and 1 in 3 (30%) rely on their own knowledge and do what is good for their body. 37% prefer taking an expert opinion and consult a nutritionist or doctor to guide them on the best diet plans. Exercising seems to be more popular than dieting to maintain good health both among those who follow a healthy routine at present and those who intend to adopt one in the future. In general, 7 in 10 people (71%) said they drink enough water in order to stay healthy. Around 3 in 5 people either stay happy and positive (60%) or get enough sleep (58%) for sound health. Just over half eat lots of fruits and vegetables (52%), around half avoid indulging in substances like alcohol, cigarettes, and drugs (49%) and just under half never miss breakfast (47%). While most people take some step to stay healthy, 1 in 7 (14%) are happy with their current lifestyle and do not intend to add any healthy habits to their daily routine. Data collected online by YouGov Omnibus among around 500 respondents in India in March 2019 using YouGov’s panel of over 6 million people worldwide. Data is representative of the adult online population in the country. For the first time ever, radio jockeys from competing channels have come together to sing the iconic song ‘Saare Jahaan Se Accha’ as an initiative towards inclusivity and tolerance in India. The song originally written by Muhammed Iqbal in 1904, has now been sung by RJs from Fever 104 FM, Radio City 91.1 FM and Radio Nasha 91.9 FM to promote the upcoming film – The Tashkent Files. The song has been sung by producer and rapper Jayaraman Mohan, RJ Rohini (Radio Nasha), RJ Anuraag Pandey (Fever FM) and RJ Archana (Radio City). The campaign was conceptualized and executed by Zee Studios and Media One Solutions. This will be used as a radio campaign for the film’s promotion. Additionally, the song will also be promoted on all Zee TV and digital platforms. Zee Studios and Media One Solutions created a similar national campaign for Manikarnika where radio listeners from across the country sent in their versions of the song ‘Bharat’ in their languages. This was curated together from across Mumbai, Delhi, Punjab, Telangana, Gujarat, Bihar among other areas. The Tashkent Files is based on the mysterious death of former Indian PM Lal Bahadur Shastri and is scheduled to release on April 12, 2019. The film will see several noteworthy actors like Naseeruddin Shah, Pankaj Tripathi and Mithun Chakraborty. (Al Minya, Egypt) –Discovery viewers from 95 countries around the world witnessed history in the making in EXPEDITION UNKNOWN: EGYPT LIVE as a team of Egyptian archaeologists and explorers uncovered a 2,500-year-old mummy of a high priest for the first time ever on live television. But that was not the only stunning find. In addition to the high priest mummy, two other mummies were revealed along with a treasure trove of antiquities, including a mysterious wax head.